Today, most of the world (including the EU) handles copyright infringement with some sort of takedown process. If you provide the public with a place to publish their thoughts, photos, videos, songs, code, and other copyrightable works, you don't have to review everything they post (for example, no lawyer has to watch 300 hours of video every minute at YouTube before it goes live). Instead, you allow rightsholders to notify you when they believe their copyrights have been violated and then you are expected to speedily remove the infringement. If you don't, you might still not be liable for your users’ infringement, but you lose access to the quick and easy ‘safe harbor’ provided by law in the event that you are named as part of any copyright lawsuit (and since the average internet company has a lot more money than the average internet user, chances are you will be named in that suit). What you’re not expected to be is the copyright police. And in fact, the EU has a specific Europe-wide law that stops member states from forcing Internet services from having to play this role: the same rule that defines the limits of their liability, the E-Commerce Directive, in the very next article, prohibits a “general obligation to monitor.” That’s to stop countries from saying “you should know that your users are going to break some law, some time, so you should actively be checking on them all the time — and if you don’t, you’re an accomplice to their crimes.” The original version of Article tried to break this deal, by re-writing that second part. Instead of a prohibition on monitoring, it required it, in the form of a mandatory filter. When the European Parliament rebelled against that language, it was because millions of Europeans had warned them of the dangers of copyright filters. To bypass this outrage, Axel Voss proposed an amendment to the Article that replaced an explicit mention of filters, but rewrote the other part of the E-Commerce directive. By claiming this “removed the filters”, he got his amendment passed — including by gaining votes by MEPs who thought they were striking down Article 13.Voss’s rewrite says that sharing sites are liable unless they take steps to stop that content before it goes online. It's strictly true that Axel Voss’s version of Article 13 doesn't mandate filters -- but it does create a liability system that can only be satisfied with filters. But there’s more: Voss’s stripping of liability protections has Big Tech like YouTube scared, because if the filters aren’t perfect, they will be potentially liable for any infringement that gets past them — and given their billions, that means anyone and everyone might want to get a piece of them. So now, YouTube has started lobbying for the original text, copyright filters and all. That text is still on the table, because the trilogue uses both Voss’ text (liability to get filters) and member states’ proposal (all filters, all the time) as the basis for the negotiation. The only online services that can have lawyers review their content are services for delivering relatively small libraries of entertainment content, not the general-purpose speech platforms that make the Internet unique. The Internet isn't primarily used for entertainment (though if you're in the entertainment industry, it might seem that way): it is a digital nervous system that stitches together the whole world of 21st Century human endeavor. As the UK Champion for Digital Inclusion discovered when she commissioned a study of the impact of Internet access on personal life, people use the Internet to do everything, and people with Internet access experience positive changes across their lives: in education, political and civic engagement, health, connections with family, employment, etc. Imagine that every time you sent a tweet, you had to click a box that said, "I promise that this doesn't infringe copyright and I will pay Twitter back if they get sued for this." First of all, this assumes a legal regime that lets ordinary Internet users take on serious liability in a click-through agreement, which would be very dangerous given that people do not have enough hours in the day to read all of the supposed ‘agreements’ we are subjected to by our technology. 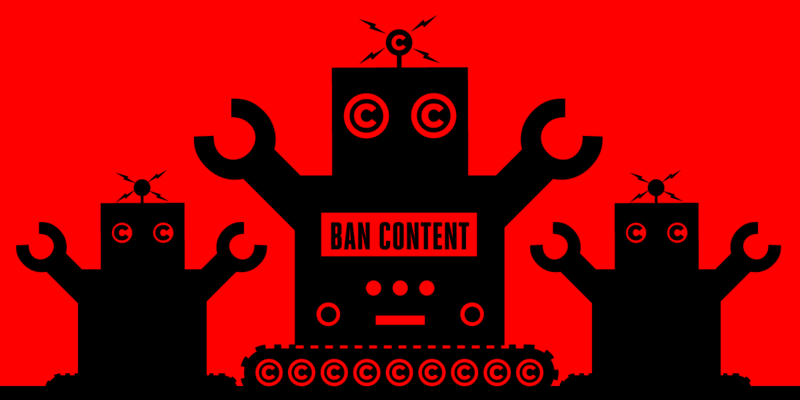 ContentID is YouTube's proprietary copyright filter. It works by allowing a small, trusted cadre of rightsholders to claim works as their own copyright, and limits users' ability to post those works according to the rightsholders' wishes, which are more restrictive than what the law’s user protections would allow. ContentID then compares the soundtrack (but not the video component) of any user uploads to the database to see whether it is a match. Everyone hates ContentID. Universal and the other big rightsholders complain loudly and frequently that ContentID is too easy for infringers to bypass. YouTube users point out that ContentID blocks all kind of legit material, including silence, birdsong, and music uploaded by the actual artist for distribution on YouTube. In many cases, this isn’t a ‘mistake,’ in the sense that Google has agreed to let the big rightsholders block or monetize videos that do not infringe any copyright, but instead make a fair use of copyrighted material. But let's take a moment here and reflect on what "cat videos" really stand in for here. The personal conversations of 500 million Europeans and 2 billion global Internet users matter: they are the social, familial, political and educational discourse of a planet and a species. They have worth, and thankfully it's not a matter of choosing between the entertainment industry and all of that -- both can peacefully co-exist, but it's not a good look for arts groups to advocate that everyone else shut up and passively consume entertainment product as a way of maximising their profits.